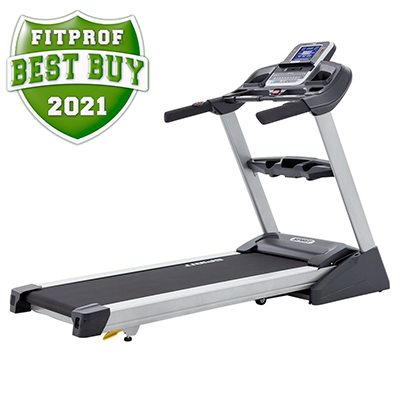 Choosing the right piece of exercise equipment is an important investment in your health, not to be taken lightly. 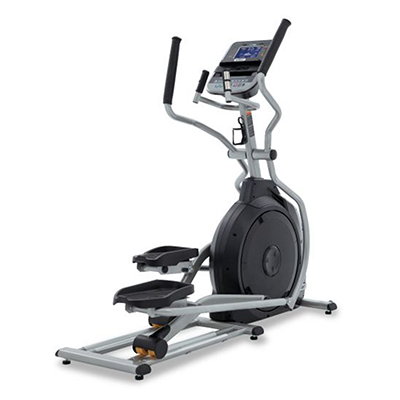 The links below lead to product pages detailing the individual specifications of each Spirit Fitness residential bike. We have confidence that whichever model you choose will be an important and reliable factor in achieving your personal fitness goals. 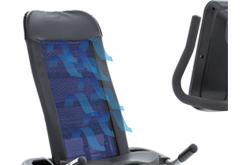 Semi-recumbent bike seats typically slide forward and backward to adjust for a user's specific leg length. 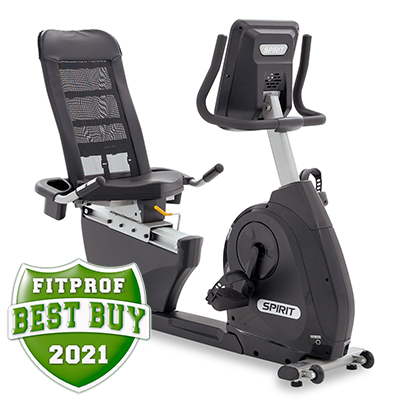 Spirit Fitness semi-recumbent bikes go beyond to offer a seat-back adjustment that leans fifty degrees allowing for a more ergonomically-correct position to ensure a long, comfortable ride. 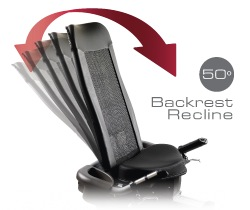 To recline, simply squeeze the adjustment handle on the bike and move the seat into your desired custom position. This feature is standard on the XBR55 and XBR95. 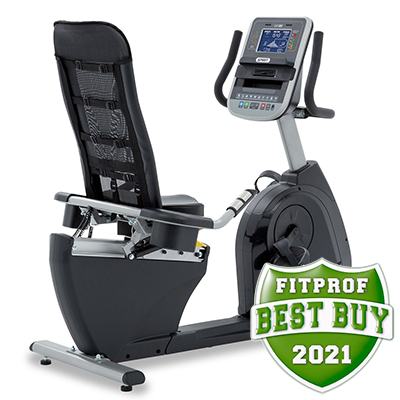 At Spirit Fitness we believe users should be comfortable while working out. To that end, our open-weave mesh allows air to flow through the back of the seat during a workout. Our adjustable buckle system allows for easy adjustments to the tension on the seat back for maximum comfort, and keeping our easy-to-wash mesh backrest clean with a simple wipe of a damp cloth is ‘no sweat’. 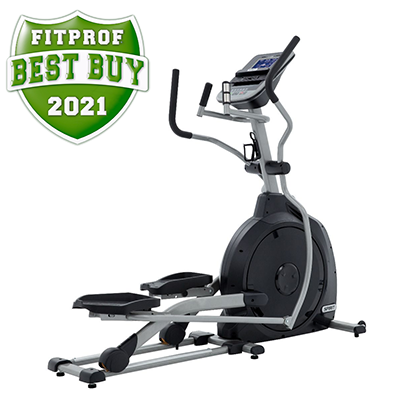 Spirit Fitness has developed the perfect formula to assure a smooth start and finish during each pedal motion by taking into account the flywheel weight, pulley diameters, belt length, and belt tension. The flywheel is an important part of any fitness bike, but an overly heavy flywheel may make the bike more difficult to use and create an unsteady pedaling motion. Instead, we focus on the kinetic energy at the pedal. 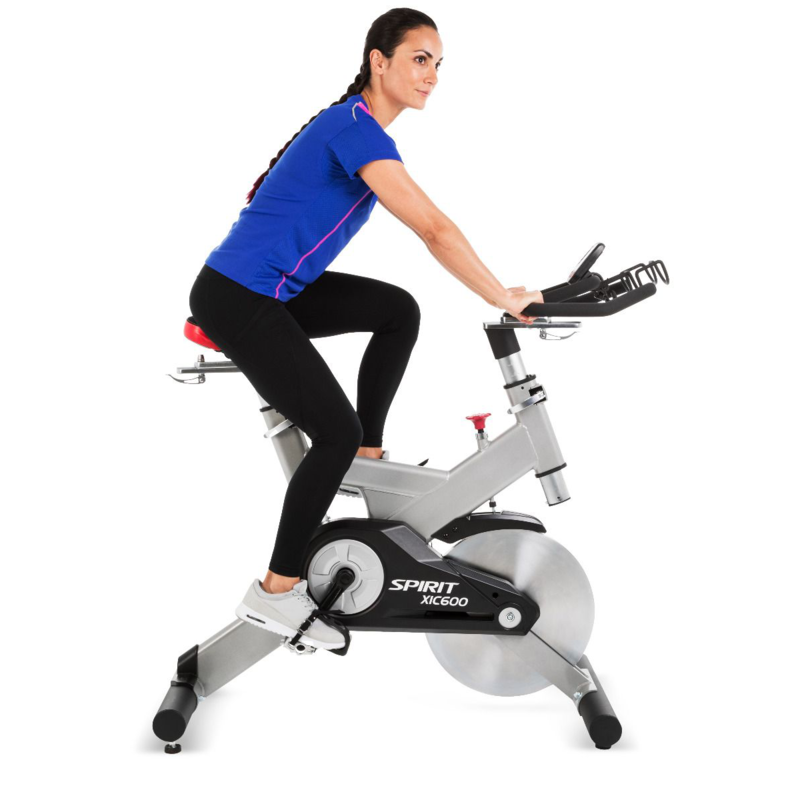 Spirit Fitness has positioned most of our bike's drive systems between the pedals, and adjusted the footpads to feature a two degree inward tilt to help make each workout more comfortable. This seemingly small adjustment makes for a better cycling experience. 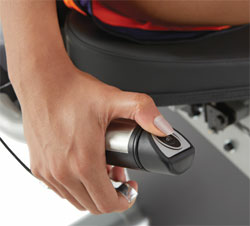 This small but critical detail is one of many examples illustrating what separates Spirit Fitness bikes from the rest. 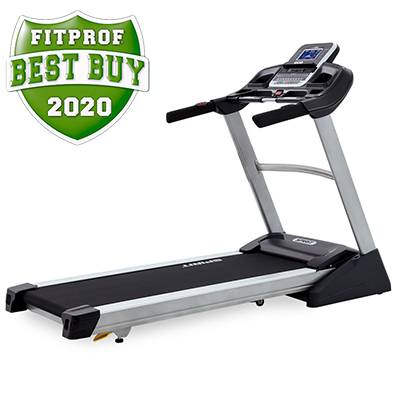 Spirit Fitness can confidently offer our customers one of the best warranties in the industry because we have been building fitness products for over thirty years. That experience gives us a deep understanding of how our during repeated, long-term use. Some of our most satisfied customers have been using their Spirit Fitness products for decades! 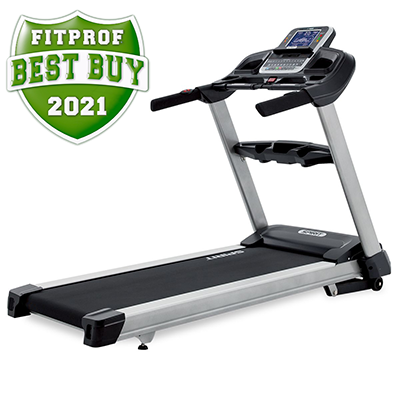 At Spirit Fitness we combine the highest quality components with our years of engineering experience and assemble our products in our own ISO 9001 factories (International Organization for Standardization; Standard 9001 is a quality management system to help ensure the factory produces quality products). 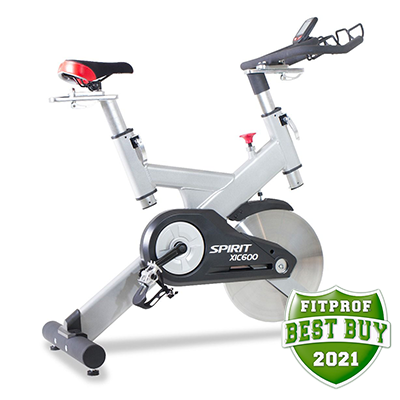 An independent survey of specialty fitness retailers awarded Spirit Fitness as their best selling fitness bikes. 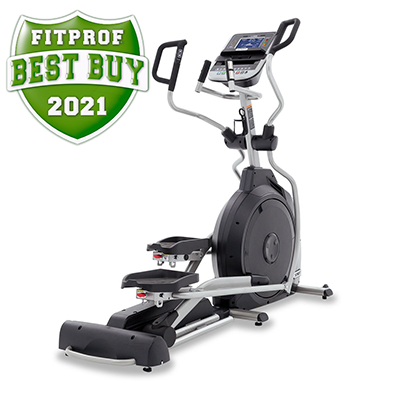 It is a vote of confidence that these professionals chose Spirit Fitness bikes over all other brands. You can be assured your investment will be around for years to come. 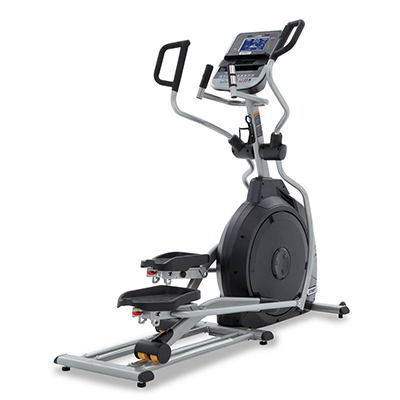 After downloading the SPIRITFIT APP, simply set up the account and pair with your SPIRIT FITNESS equipment. Once these steps are complete the app will be ready to track your workout schedule, design your workout plan, and set your workout program while all personal profile and exercise data will be stored in your mobile device. During your workout you can watch a movie, catch up on news, and check your email on your device while the SPIRITFIT APP runs in the background to record exercise data. The SPIRITFIT APP is able to communicate with Fitbit, iHealth, RECORD, MapMyFitness, MyFitnessPal and other open source training apps. This allows users to continue using the fitness apps they are familiar with and keep all workout history in one convenient location. A key factor for any product's user accessibility is its interface. During the development of our new consoles we focused on the simple principle of ensuring relevant workout information is easily accessible. 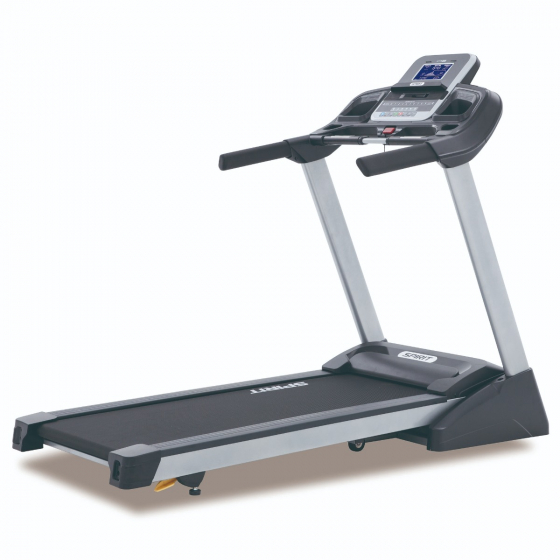 A quick button press allows the user to begin a walk, run, or one of the specialized workouts and some models allow the user to develop their own programs. Our large, easy-to-read consoles give constant feedback from calories to distance to time, while some models offer separate displays for heart rate and muscle activation. It’s important to understand which muscle groups are gaining the most benefit during your workout. On our treadmills users are able to engage their glute (bottom), hamstring (back of thigh), quad (thigh), calf, pec, and arm muscles. The LED lights indicating muscle activation activate during three degrees of engagement: green represents minimal involvement; amber medium involvement, and red is full or heavy involvement. This quick reference allows users to challenge themselves during a workout. 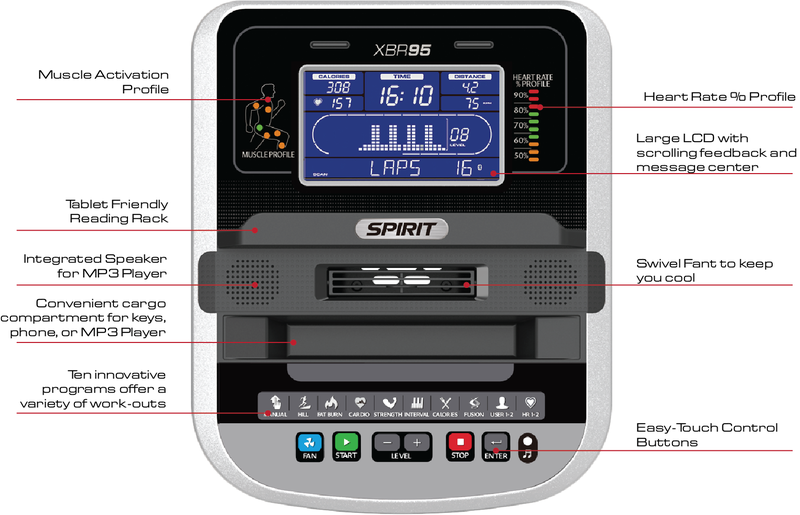 Most Spirit Fitness treadmill consoles feature a swivel fan to help users stay a bit cooler during a workout, as well as an integrated set of audio speakers. A 3.5mm adapter cord is included allowing users to attach any compatible music source and enjoy their favorite music to help them go the extra mile. Heart Rate training is proven to be one of the best ways to measure your workout. In order for users to gauge their workouts, some models offer an integrated Heart Rate % Profile indicator. Based on a user's age (entered during the programming phase), these models offer a quick reference look at a user's heart rate percentage compared to a maximum projected heart rate. Console integrated LED lights display amber for 50-60% of the maximum projected heart rate, green indicates 65%-80%, and red for 85%+. Our semi-recumbent bikes have been designed with the intent that all necessary adjustments can be made from a seated position and all key features can be easily reached during a workout. 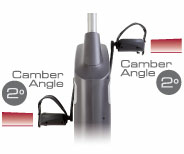 Two different levers are included to more precisely adjust the seat position: the left side lever will slide the seat to the front or back along the precision aluminum rail; the right side lever will adjust the seat back's angle on the XBR55 and XBR95 (these models also feature thumb controls on the side handlebars to adjust the resistance). 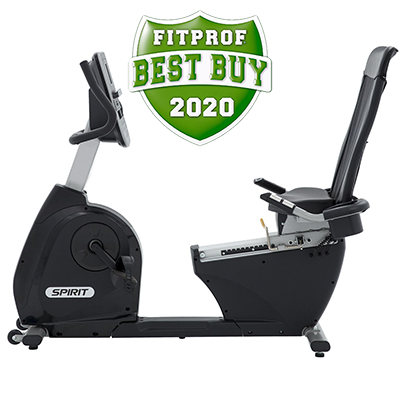 All Spirit Fitness semi-recumbent fitness bikes include heart rate grips on their seat side handlebars handlebars making heart rate monitoring convenient and comfortable. These bikes also feature a water bottle/accessory holder attached to each lower handlebar. 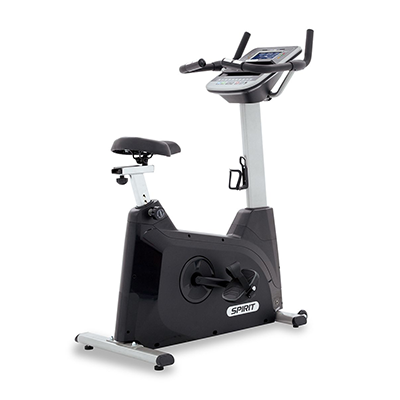 Spirit Fitness bikes are easy to use and adjust. The bikes can be precisely adjusted to a custom workout position within seconds meaning users can quickly begin the most comfortable and effective workout possible.